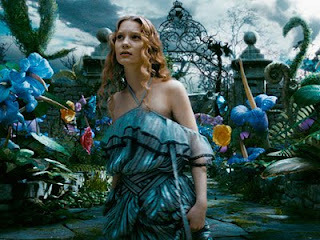 I just saw Alice in Wonderland (in 3D) today, and I have to say, it completely exceeded my expectations. This is such a beautiful movie. It's impossible to describe how it made me feel. It's such an interesting story of Alice's return to Wonderland--though she doesn't remember being there before--to help defend the inhabitants from the Red Queen. Parts are funny, parts are sad, everything is beautiful. Gorgeous. I can't get the images out of my head. Mia Wasikowska (pronounced vash-i-kov-ska) did an incredible job. Several times I had to remind myself that she was not Claire Danes--she looks a lot like her! I expect great things from this young lady! 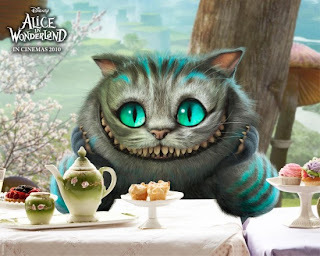 The Cheshire Cat. I loved the animation of this guy... the way he just floats around and evaporates... so incredibly cool. 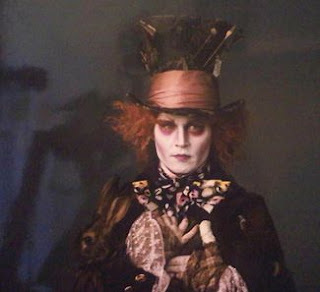 Of course, Johnny Depp is ever-brilliant, but at times it seemed as if he didn't know if he was the Mad Hatter or Jack Sparrow. Maybe I've just seen Pirates too many times and forget that Jack's mannerisms are, in fact, Johnny's. The Hatter changed accents so often, so as to affirm his "madness" I'm assuming, that it was difficult to follow his goal at times. He also said quite a few phrases I couldn't understand. I suppose this was intentional... but it was a bit irritating. On the whole, the story was interesting and exciting, the acting was good all around, the characters were sympathetic, the COSTUMES WERE INCREDIBLE (I want Alice's red dress), and the animation was top of the line (see it in 3D!). And as always, musical genius Danny Elfman envelops the story with a gorgeous score. I recommend it to any Tim Burton fan, because there was no doubting for even an instant that this was his work. Well done. Loved it. Lived up the the hype. Ha! Great minds think alike. I just blogged about the same thing. I absolutley LOVED it. Glad to hear it is good, since I read a review that was pretty harsh on it. Now I'll go see it! yeah, it's good to get an opinion from a movie-goer instead of a "critic." oh good. I am glad to know this. I want to see it, but don't want to waste precious babysitter times on crap! I will reiterate that you should be a fan of Tim Burton's work before you see this... because to some, his work IS crap. But I think it's brilliantly creative. As for the poem, my husband has most of it memorized! He loves that poem! I love your layout. It is very chic! I'm SO excited about this movie!!! I'm a pretty diehard "Alice" fan, in any form or fashion. 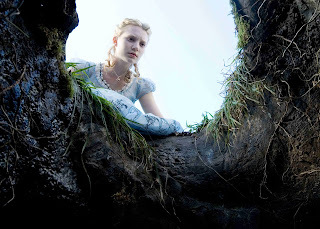 Did you see the Syfy miniseries they did based on "Alice in Wonderland"? It was great! Did you see this in 3D....I almost went last night but didn't. Yes, 3D is the way to go!! It looked amazing! I heard that it received mixed reviews and was so disappointed (I've been looking forward to this for almost a year now). I'm really glad that you enjoyed it, and will definitely get out see it while it's in the theater. I have to wait for dvd..2 yr old wont let me watch it.